Discover the local side of one of the most popular destinations in Baltimore, the Inner Harbor. Hear fascinating tales about international sports legends and take a ferry ride across the Harbor to taste a few of Baltimore’s favorite foods. This tour will give you a great introduction to what our lively city has to offer. 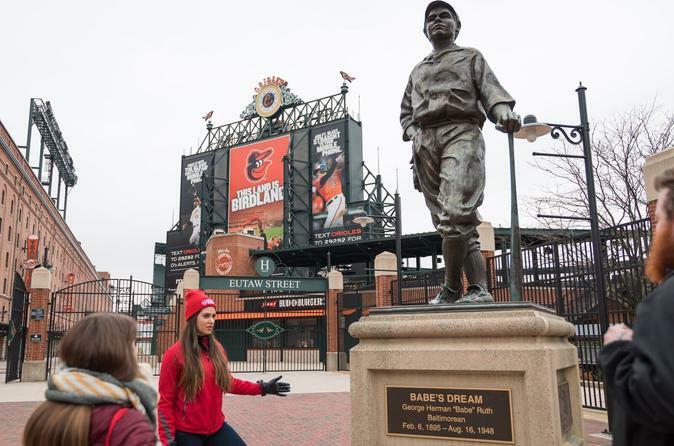 Our tour of Baltimore’s iconic Inner Harbor begins at the Camden Yards Sports Complex — at the feet of one of Baltimore’s most celebrated sons, Babe Ruth. Here, we’ll talk Baltimore sports and fill you in on the city’s transportation history before setting out to see the famous sights of Baltimore! After sampling Baltimore’s world-famous crab in one of its many delicious forms, you’ll set out on a short walk to the docks. Weather permitting, you’ll begin the over-water part of your tour, onboard one of the Inner Harbor’s many ferries. Aboard the ferry, you’ll have a unique perspective and a beautiful view of the harbor and its attractions — seeing modern-day Baltimore while experiencing the same (albeit much shorter) journey that many early settlers experienced hundreds of years ago. Once you’ve disembarked your seafaring transportation, you’ll have to find your land legs for the final stroll of your tour. You’ll continue to make your way around the harbor, now seeing iconic historic attractions, including the civil-war era ship, the USS Constellation. You’ll know when you’re getting close to the tour’s final stop... as you will be able to smell the sweet deliciousness in the air! A sweet sample of local fudge is just the thing to finish up your tour of the Inner Harbor. Make sure to ask your guide for his or her favorite fudge flavors.